Easy Zingy Fruity Mocktail recipe in under 15 Minutes. For some reason, I still feel we are in mid September. The weather has been fabulous last week, infact it felt so much like Indian summer . All that the weather demanded was some cool breezy clothing and a glass of cocktail / mocktail and laze in the garden. Play with the kiddos , paint some prop boards and just enjoy the last lag of bonus weather. But nothing of that sort happened !! I am pretty sure, this weather will not last long on the cards. It does feel chilly in the mornings and late evenings. The leaves on the trees are changing colors , some of them have began to fall . Hello October !! Its Pinktober ! Since we did not get anytime to stay indoors over the weekend , the mocktail plan got pushed to the weekday i.e Today !!! Though the weather sucked, raining non stop .. this pomegranate mojito was the best thing I could say happened today in this weather. Making this drink is pretty easy, if you have all the ingredients ready and stacked up. Since I was sure to make this breezy fruity zingy drink around the weekend, I made my limeade concentrate ahead in time. It is simple, just incase you decide to make it at home. For recipe – click here. To 1/4 th cup of the concentrate, I added 3/4 cup of water to make my Limeade. Also got some help from the kiddos to make some fruit ice cubes.. 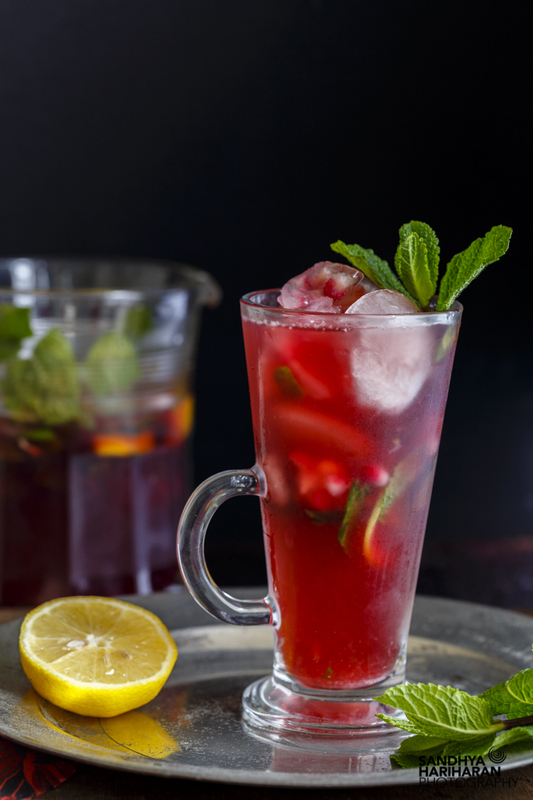 Without much a do , lets head straight to this colourful zingy sparkling mojito. Proportions for them is just how you would like them to be.. None of the measurements need to be 100 % perfect. If you enjoy your drink a lil more zingy , add more limeade . If you like it sweeter, add some more sweetener like honey or sugar to your limeade . I leave you here, to make this drink to your imagination. Pomegranate Ice cubes + more Ice cubes as desired – For recipe – click here. Clean the mint leaves, tear the leaves and add them to a large jug.Reserve1/2 of the lot for garnish and serving. Quarter 1 lemon and add them to the jug along with the mint leaves. Using a rolling pin, bash the mint and lime to release the flavours. Add the limeade, pomegranate – apple juice followed by pomegranate juice. In each of the glass, fill in ice cubes and strain over a sieve the pomegranate mix. Appletiser Pomegranate Apple Juice is a 100% sparkling fruit juice. If you are using just pomegranate juice, do add a sparkling drink like Sprite or may b store bought lemonade . Gorgeous drink to enjoy the bonus weather. I could see the new props in play too. Beautiful pics. Now you make me long for summer. october here is like mix of summer and december in India.Enjoying these drinks can be only for a little while right? By the way this mocktail look fantastic. Everything about the drink looks so so so pretty! Very refreshing post. Love it.Thanks for sharing.Keep it up. Stunning drink, though the climate is nasty, i dont bother to drink this mojito..